Happy Birthday to the NY Mets on their 54th birthday. 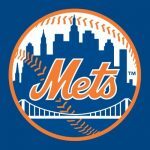 On May 8, 1961 the nickname for the New York Metropolitan Baseball Club officially became the Mets. It beat out a host of other names including the Jets, The Islanders, and The Burros ( as in boroughs). No kidding. You could look it up, just ask Casey.